I've got some BIG news for myself, this lovely blog, and my lovely life. Big changes are happening! I was offered (and accepted!) a web content writing position that I'm completely psyched about. There's a little catch that I'm perfectly okay with. ;) The position is in Cedar Rapids! I'll be relocating from this college town of Ames in the center of the state to eastern central Iowa. 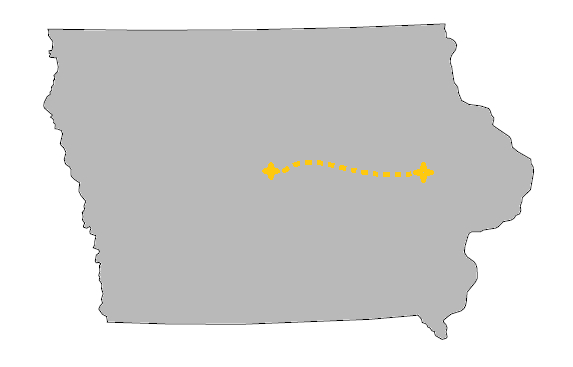 Nearer to Iowa City and the Amana Colonies. Nearer to my handsome boyfriend. And about the same distance to my family in my hometown. I have much to do! Much going through stuff and tossing/donating/selling unneeded items. Much packing, packing, packing. (Oh, the horror!) Much moving. Probably from Ames to my hometown and then to Cedar Rapids when I find an apartment. And much settling into the new place and the new job. Everything is moving so fast that I hardly have time to think about how much I'll miss Ames, the friends I've made here, and this cozy attic space I've come to call home. My attic bedroom is my favorite place I've lived in Ames. I'll miss the cozy bed nook, high ceilings, antique doorknobs, and summer nights sitting on the roof with a few friends and a few drinks. But I'm soooo excited for this new chapter in my life! Posts over the next couple weeks might be sparse and revolve around moving/packing/etc. when I get the chance to sit down and procrastinate a while. But once I'm locked into a lease on a new place, you can better there'll be tons of small space decorating content coming your way! Congrats! That sounds so exciting! I love your attic bedroom, but it will be interesting to see how you decorate your next space! Congrats! That's such awesome news! Ah a lot of pig changes! Congrats and good luck with this new chapter of your life! congratulations! I always get so excited when you have a new post up. :) Hope the move goes smoothly!